There are no additional FEES to be added to our price! This saves you up to $2500 over what other dealers charge in extra fees including Documentary, Notary, Prep, and Environmental. We are one of the only stores in the USA with no fees, that is why we sell all over the country - saving our customer's thousands! Many customers don't realize how much in extra fees they pay when buying a car. 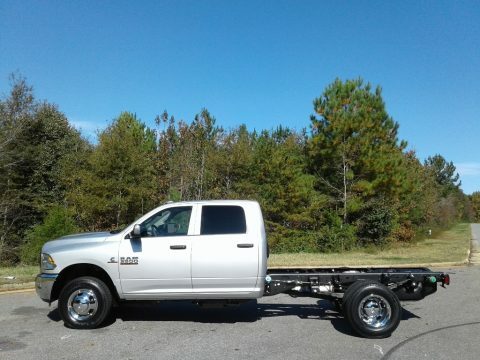 We also offer free delivery/airfare to many states.This is a new 2018 RAM 3500 Chassis Tradesman Crew Cab 60" C/A 4X4 . It comes with the 3 year - 36,000 mile Factory Bumper to Bumper Warranty as well as a 5 year - 100,000 Factory Powertrain Warranty.. It is equipped with Power Windows and; Locks, Keyless Entry, Cruise Control, Heavy Duty Vinyl Seats, Black Vinyl Floor Covering, Uconnect 3.0 AM/FM w/ Bluetooth, Sirius Satellite Radio 1 yr Service, 40/20/40 Split Bench Seat, Clearance Lamps, Snow Plow Prep, Fog Lamps, Trailer Brake Control, Tow Hooks, and Customer Preferred Package 29A. Contact Don Hilton or DL Jones at 1-800-779-3634 The MSRP is $55,320 and internet/eBay price includes the factory rebate.Money Back Guarantee - It comes with our 5 day money back guarantee. Please call us and ask for more details on the 5 Day Guarantee. Finance Application - we have over 18 Banks/Lending Institutions and are able to obtain for you a competitive interest rate. Apply online at www.financeapplication.org.Price and/or Payment do not include sales tax, you only have to pay sales tax in your home state.Hickory/Newton, NC: Hickory is a beautiful area located in the foothills of the Blue Ridge Mountains and has the largest number of furniture retailers in the world (we have furniture malls and hundreds of outlets/stores). We are close to Asheville, NC (home of the largest home in America - Biltmore Estate - open daily), Charlotte, NC - home of the NASCAR Hall of Fame along with most of the NASCAR team garages - tours available, and also Blowing Rock, NC which is one of the most gorgeous down towns in America - with great shopping and dining.Travel: we have many customer's fly in and make it an excursion to visit attractions "on the way home." We have had them even fly in from Hawaii to see the great U.S.A. then have their vehicle shipped from California to Hawaii! If you need assistance with travel plans, please ask one of our friendly internet sales reps, we would love to help you plan a fun trip!Trade-ins: we desperately need trade-ins and we can pay you top dollar for your trade, including motorcycles. Please call us with any questions or for an appraisal on your trade-in.